Outdoor Christmas decorations add a festive look to houses and allow everyone who sees them to feel a little joy of the season. 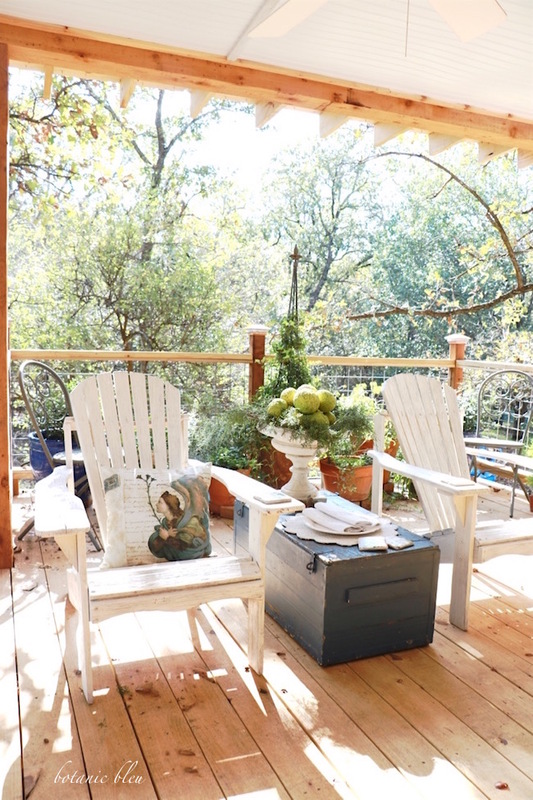 With just two natural greenery elements, porches, walkways, fences, and doors take on a special aura that brightens everyone's spirits and adds a smile to their faces. 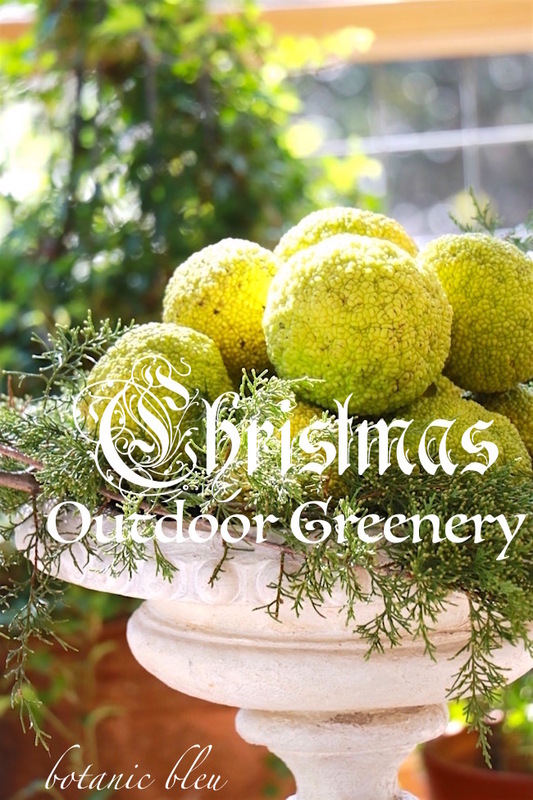 With just two, yes, TWO natural greens, a little bit of Christmas can be added to outdoor spaces. The best part? Both of these bits of greenery can be found FREE all over the southern states. Similar greenery can be found everywhere else. 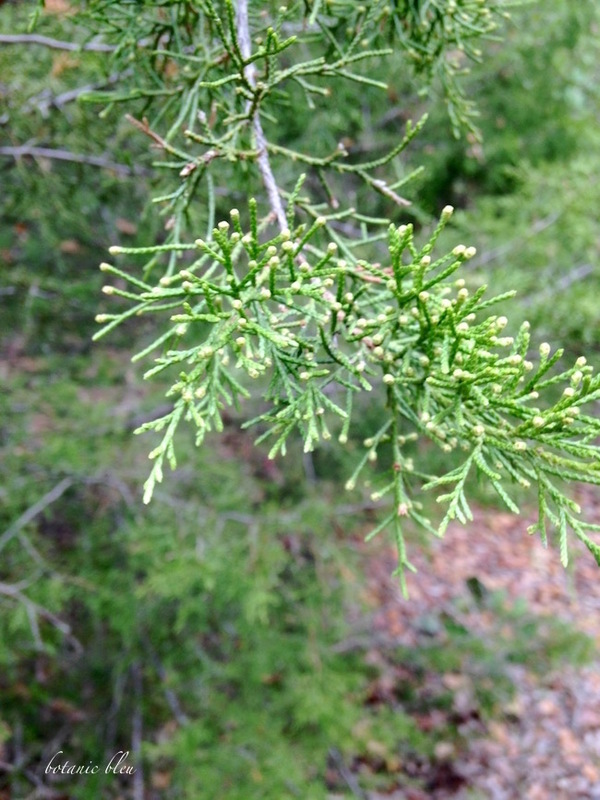 Incense cedar grows wild in north Texas. There are several trees on our two acres in the country. Other varieties of cedar also grow wild in all southern states. Look around your area for evergreens that grow near you. Chances are you will find a beautiful evergreen in your yard or in an area near you from which you can harvest some branches for free. Another place to find free greenery is Christmas tree lots, including Home Depot and Lowe's. Both Home Depot and Lowe's in my area trim the bottom of purchased Christmas trees for customers. Both stores give away the trimmed branches to anyone who asks. Bois d'Arc fruit is known as horse apples in Texas, and can be found on the ground every fall. There is a tree in a green space between the back of a large shopping center and the road near me. The tree drops scores of fruit every fall that have to be cleaned up, and the horse apples can be picked up by anyone. Once again, look around your area for large fruits or pine cones that fall off trees near you. Once you start looking for natural greens, you will discover you probably have several from which to choose. 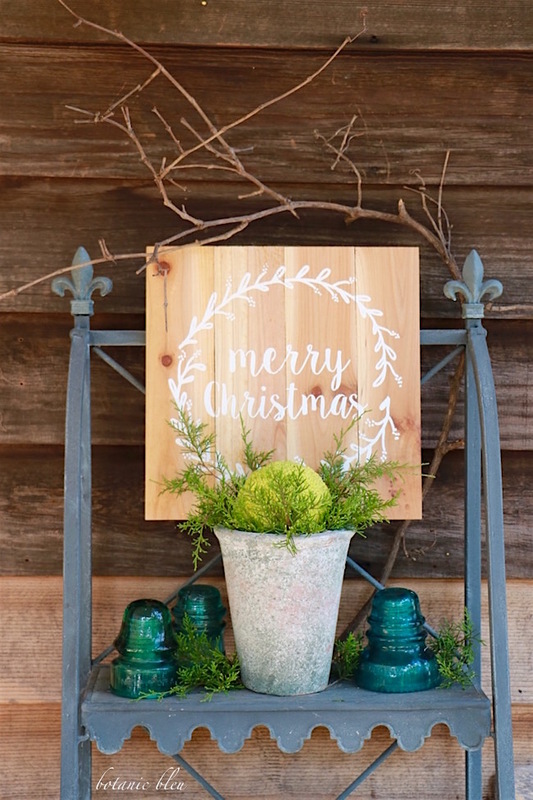 Add a layer of the evergreens to a large container like a pedestal urn, large crock, rustic box, or a large basket. Fresh outdoor Christmas greens can also be laid right on the ground in the southern states that do not have snow cover for extended weeks at a time. Stack the horse apples on top of the cedar greens. 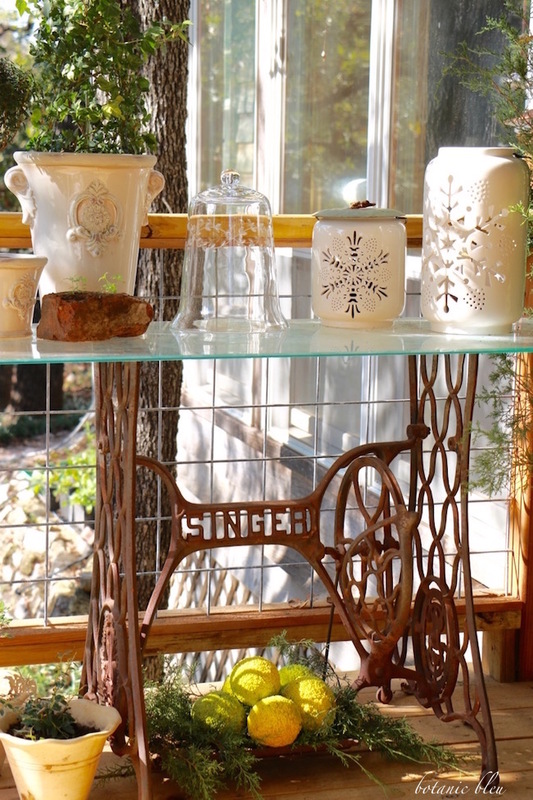 These cedar branches and horse apples are lying on the treadle of the vintage Singer sewing machine base. 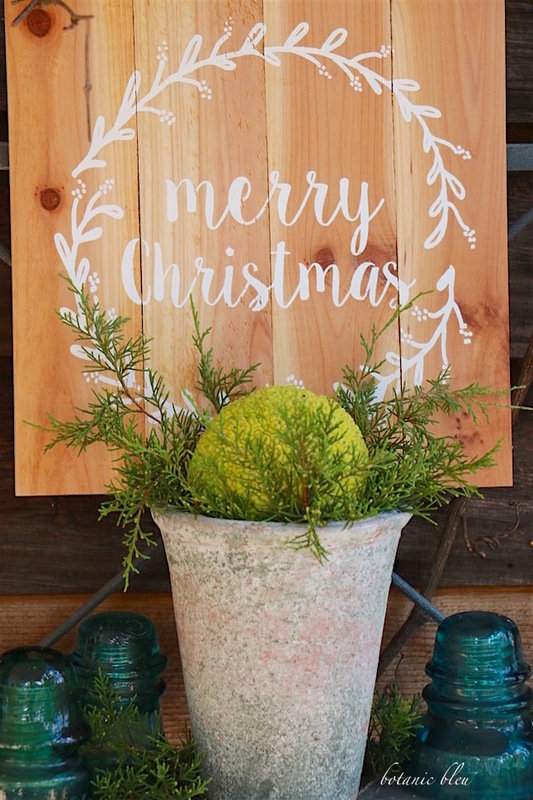 One large horse apple nestled in short sprigs of incense cedar in a rustic flower pot adds the Christmas look needed for the simple wooden Merry Christmas sign. 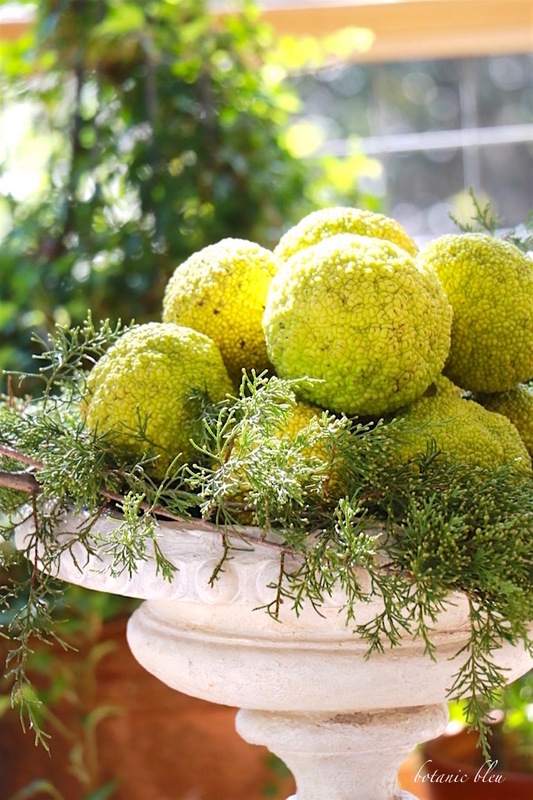 Since horse apples exude a sticky sap and a sweet odor, I only use them as outdoor greenery, not inside the house. 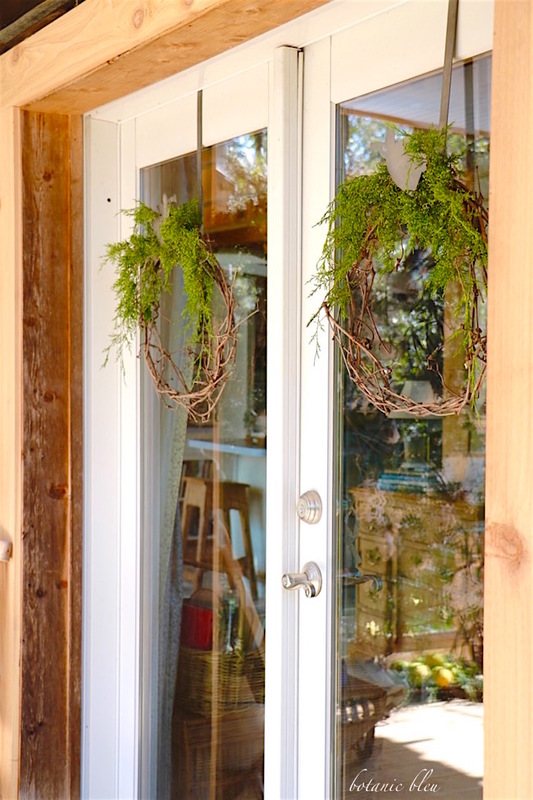 Doors are a natural location to add more Christmas outdoor greenery. 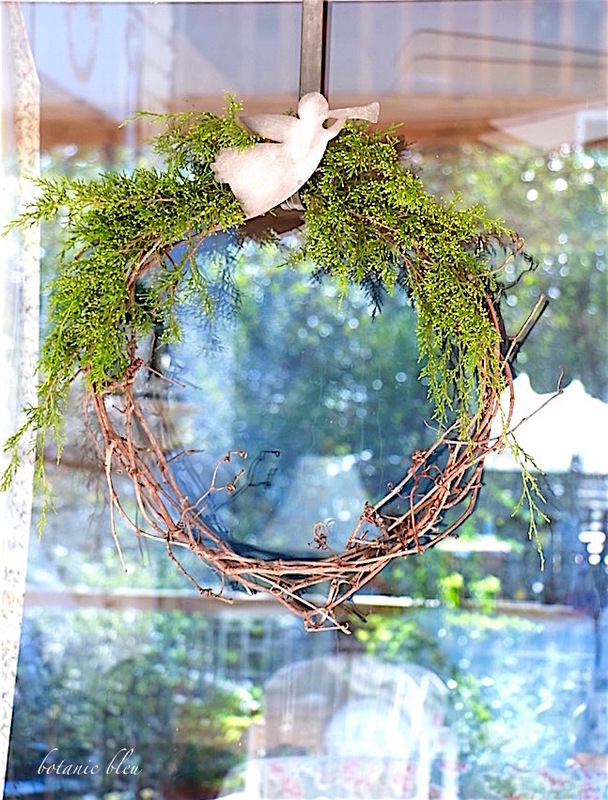 Homemade grapevine wreaths withstand rain, snow, freezes, and........ heat. In north Texas, fresh greenery from northern states or snow-covered mountains dries out quickly due to our warm winter temperatures. True, nighttime lows will include below freezing temperatures, and daytime highs will include low 30s to 40s, and there may be snow. However, snow only lasts about 2-4 days and warmer temperatures in the 50s return. Cedar added to the top of the wreath accentuates the rustic tin angel wreath holder which can also withstand a wide range of weather variations. 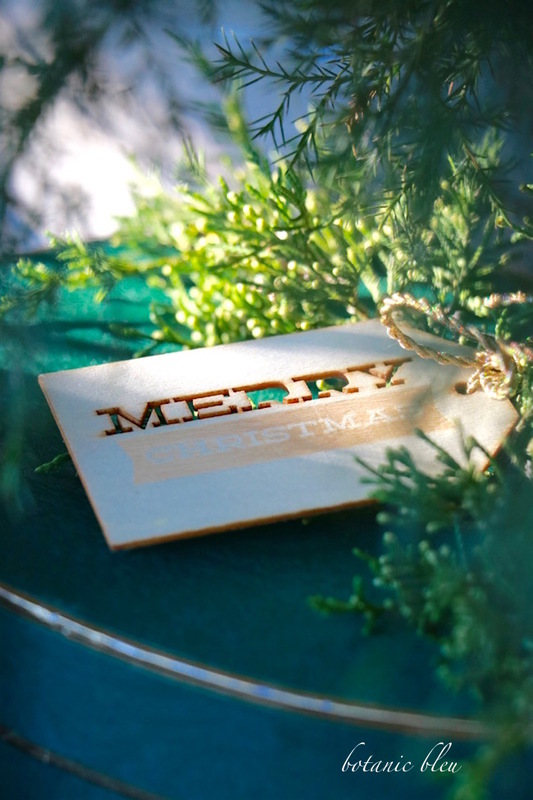 Small branches of incense cedar can decorate Christmas presents in place of ribbons. When using fresh greens as package decorations, wait until 1-3 days before presenting the packages to add the greenery. Fresh greenery will dry out, become brittle, and look unattractive if attached several days in advance. Water outdoor greenery occasionally to prolong its life. However, do not allow the horse apples to sit in water because they will decay much more quickly. Check the fruit periodically, and remove any that has rotten spots. Remember, one bad apple spoils the lot. For no money, anyone can have a beautiful natural Christmas outdoor greenery arrangement. Once Christmas is over, the fresh greenery can be composted, which means not having to store the decorations. 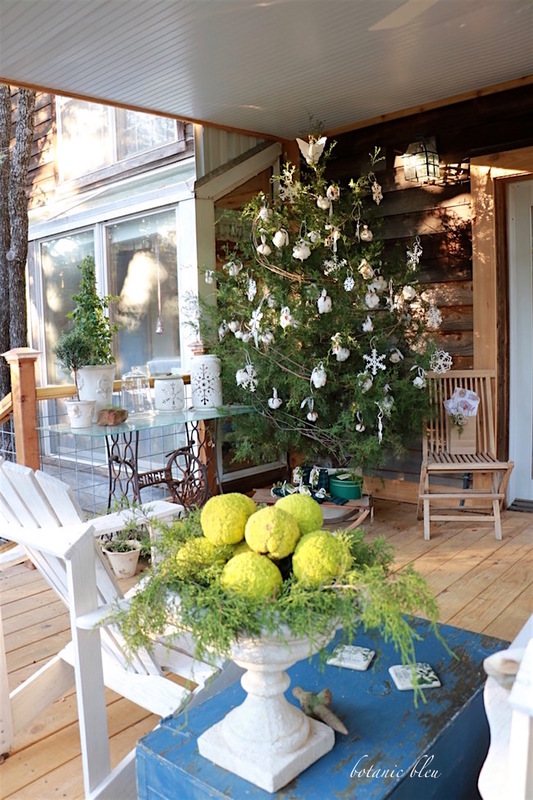 Count the reasons to create natural Christmas outdoor greenery arrangements. No cost to use... like electrical lights. Beautiful, eye-catching decorations during daylight hours. Can tolerate most weather conditions. Nothing to store after use. 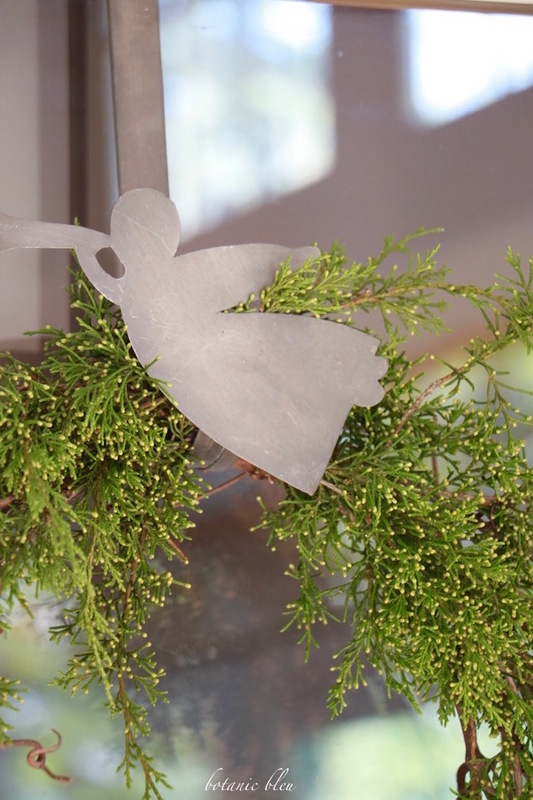 Do you have favorite natural greens you like to use for outdoor Christmas decorations? This is a wonderful post. I loved it. Thanks for linking at The Count Down To Christmas. 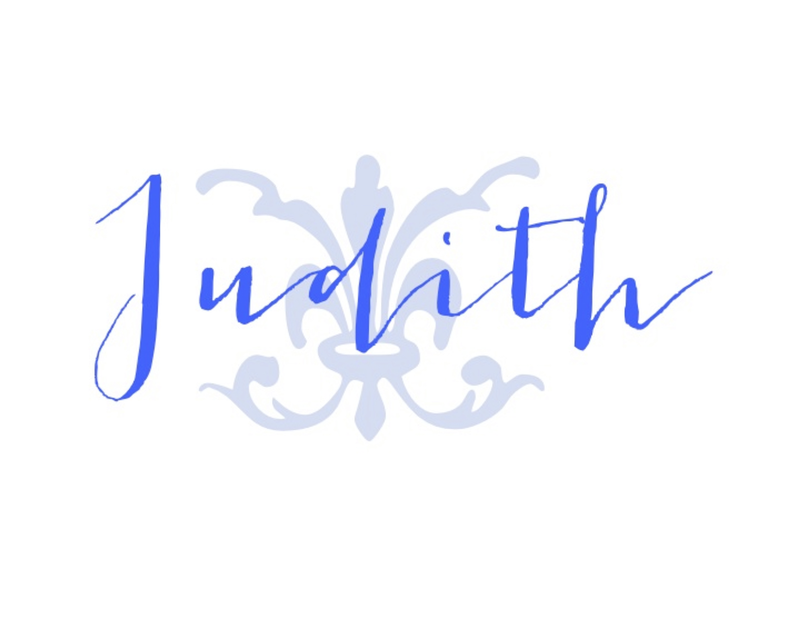 The new link is up. Come over and link this and any Christmas post. I'd love to see some archives too! Link up and let's party. I also use natural elements in decorating. In addition to what you mentioned, I include holly, Nandina berries, and lots of pinecones. I try to find things that will last a long time in pots outdoors. I am drooling at what you have done!! I love it! Inside, I use artificial greens, pinecones and cream colored pillar candles & votives (both battery operated) on our mantel which I leave up all winter. For Christmas, I add some holiday touches such as shiny red ornaments, bright red bows and anything glittery. Even after the holidays with all the red, glittery things gone, the mantel is very serene and warm when the candles are lit. Count me in as another horse apple fan. Love the color. Great looking cedar! So healthy and I love this variety. Our indigenous variety in Alabama is not as pretty but maybe I need to look harder to find some. Love how you decorated your deck for Christmas. 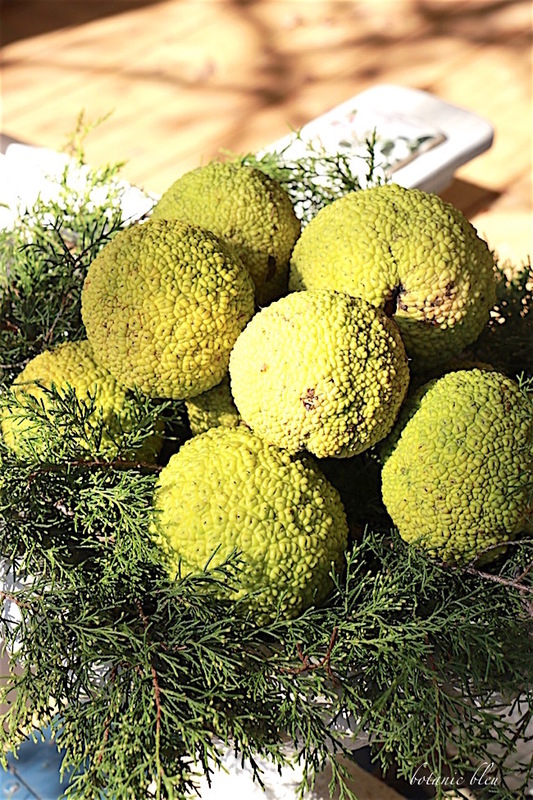 I like hedge apples and have some faux ones in a similar white urn to yours that never leaves its spot in my den. 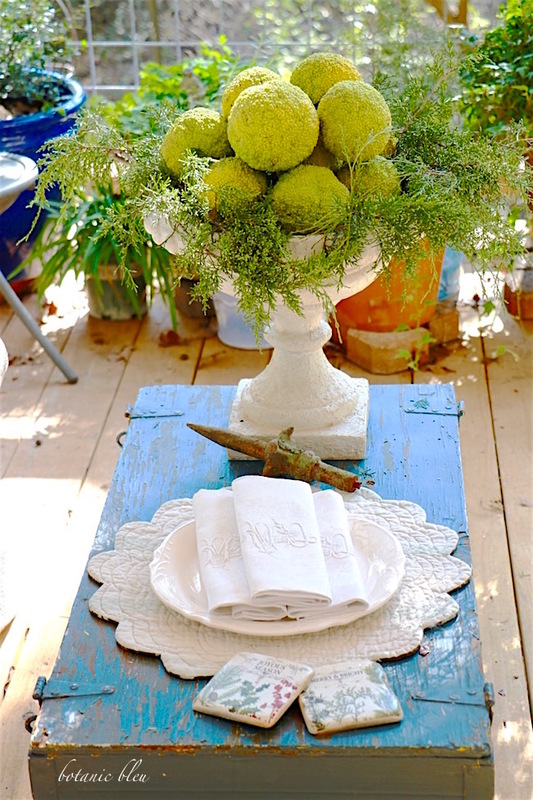 Great thoughts on using natural greenery. I love this. I've used fresh greens in years past. I love your gorgeous displays and photos.